My name is Marine*. I am 41-year-old and a mother of seven. Six years ago, my husband and I divorced due to psychological and physical abuse that I endured for many years. As a recently divorced, vulnerable, unemployed single-mother, I was unable to provide for my family. The years of abuse made me very weak, scared, and overwhelmed. I lost my house, my children left, and my way of life as I knew it disappeared. One year ago, I came across the AGERS (Advancing Gender Equality and the Rights of Survivors) program through the Spitak Helsinki Group NGO—an opportunity that marked a turning point in my life. Prior to joining the program I didn’t have a profession, but had always enjoyed making handicrafts, baking, and above all being a good mother to my children. I knew that to get my children back, and to be the mother they needed, I would have to get a steady job. With that aim in mind, I attended both the business development and job development courses that the program offered, along with one month of vocational training, which helped me improve my baking skills. The courses equipped me with the confidence and skills I needed to turn my passion for baking into a profession. I soon was able to develop a business plan and present it to the project committee. I was shocked that my business plan was chosen and selected for funding, and more so, that I was qualified to start and run a small business! It has now been seven months since I started to market and sell my homemade baked goods in the Lori region. When I first started, I was baking cakes for neighbors and providing samples for tasting in an effort to increase my customer base. Once they started to gain popularity, I decided to deliver my baked goods to the local store to be sold—they sold out in one hour! 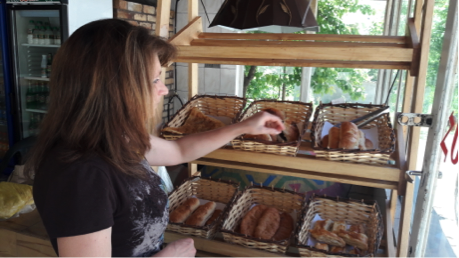 Because of how popular my goods were becoming in the community, I was hired as a saleswoman in a local bakery. There I sell my own pastry and meat products, and plan to start producing lavash (Armenian bread). I now earn enough of an income to support my children and myself. Getting back on my feet has helped me to rebuild a relationship with my children—all seven of them are again living with me. Some of my children, who are now in college, are even willing to help me improve my business based on what they are learning in their courses. Today, instead of dwelling on the difficulties I have experienced in my life, I focus on the successes I have achieved. One day, I would like to open my own shop. My life has been changed dramatically since I participated in the project, and I plan to pay it forward by helping other women. The AGERS project is finance by the European Union and implemented by the NEF UK and the Gegharkunik Chamber of Commerce and Industry. Since its launch in January 2015, the two-year project has helped 230 survivors of gender-based violence gain increased employability, small business skills, and establish small businesses. Seventy women received vocational training in various specializations, 130 received financial support to start their small businesses, 80 developed career development plans, and 50 women found employment in the labor market. “The project has improved confidence and self-reliance among survivors of gender-based violence, providing women with safe options when making decisions that affect their family’s lives,” Arpine Baghdoyan, NEF’s country director in Armenia, explained. Although the project ended on January 20 2017, NEF and its partners hope to find opportunities to continue this important and necessary work in the region.